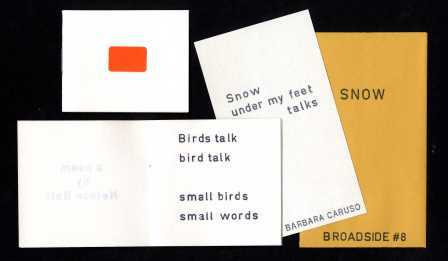 Barbara Caruso was born in Kincardine, Ontario, Canada, in 1937. She was first and foremost a visual artist, whose preferred self-descriptor was ‘painter’. She also wrote poetry, and, for a decade, ran Seripress. In 1965 she married Nelson Ball, poet, publisher, and later bookseller, who founded the small poetry press Weed/Flower and whom she always referred to as ‘my poet’. In 1967 the couple moved to Toronto, where Caruso became involved in the poetry scene which was newly emerging there. During the years when she was painting, Caruso designed covers for little magazines and for Coach House Press and Weed/Flower Press. Over the course of her life Caruso exhibited her large-scale canvases in galleries and museums in Canada, the United States, and Europe. 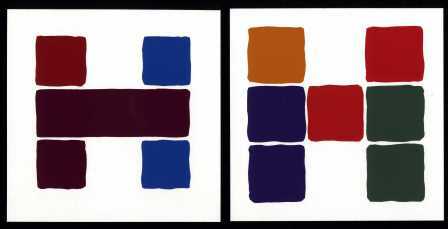 One of her major projects, developed between 1969 and 1983, was the Colour Lock paintings, comprising nine series (141 paintings in total). Her intense preoccupation with colour and line in the paintings of this period informed her collaborations with bpNichol, and manifested itself in the Seripress books. 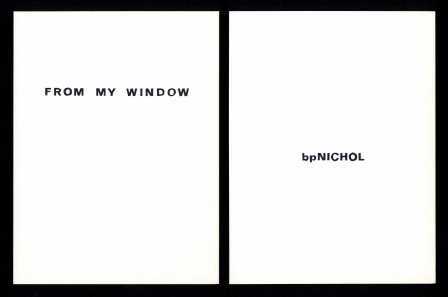 bpNichol was one of Canada’s most respected non-mainstream poets. He formed the Toronto Research Group with poet Steve McCaffery. He was an innovator in sound poetry and was a member of the Four Horsemen. 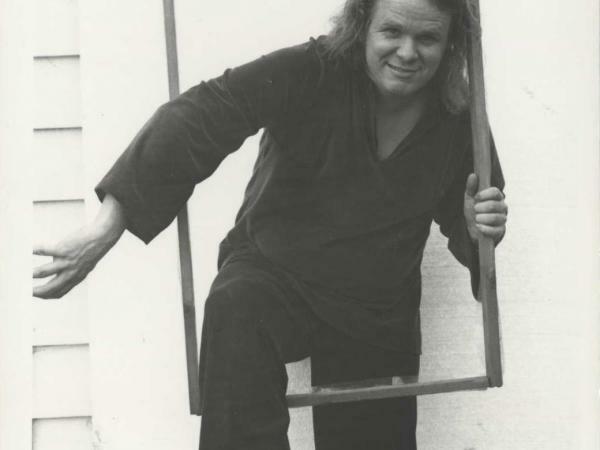 In 1970 he won the Governor General’s Award for a group of three chapbooks and an anthology he edited titled The Cosmic Chef: an evening of concrete (Oberon Press). This award considerably raised his profile in Canada. One of the chapbooks was The True Eventual Story of Billy the Kid , with an illustrative cover by Caruso, and published by Weed/Flower Press. Nichol’s favourite letter was ‘H’, and his favourite colour was blue, both of which have a significant presence in the Seripress collaborations. Nichol met Barbara Caruso through Nelson Ball in the late 1960s. On one of his visits to their home (which also served as her studio), Nichol observed that one of her paintings reminded him of the panels of a comic strip, and that he would like to draw on it. Horrified at this idea at first, Caruso later thought that something interesting could come of it, and devised a method by which Nichol could do what he wished. This method would lead to their first collaboration, The Adventures of Milt the Morph in Colour . Some manuscripts arrived with illustrations already supplied by the poet. Caruso sometimes redrew these illustrations in order that they transferred well to silkscreen. She also cut letters by hand. The hand-cut images and letters were placed on to profilm sheets (a lacquer gel on plastic) to make a stencil, which would then be fixed to the silk screen of the press. The pages were hand-printed; Caruso did not use photo-silkscreen methods. After each title was printed, the profilm stencil was dissolved from the screen, ensuring that the title could not be printed again using that original plate. Even the folders in which the titles were housed were handmade by Caruso. As it turned out, the inks and solvents used in the printing process made Caruso ill. In response to this she formally closed Seripress in 1981. 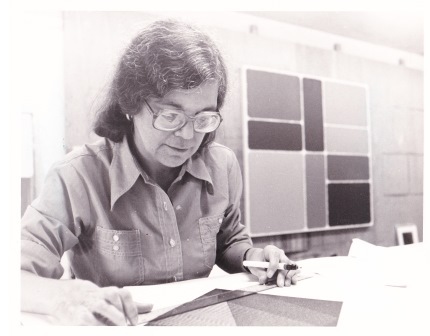 Barbara Caruso designed Seripress to be profit-making; the profits were used to support her painting. While she ran Seripress, she painted; and all the while she theorized tirelessly about colour, art, and poetry. 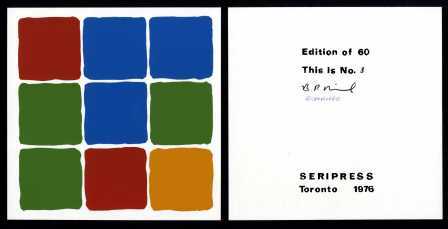 During the eleven-year lifespan of Seripress, Caruso published twenty-one titles, all of which were printed at her studio in Toronto. These twenty-one titles are represented in the collection at Sheffield. The final four titles, all by Nichol, were published in 1979, the last one being Movies , which consists of ten loose leaves in a card folder. Later, when Caruso and Nelson moved to Paris, Ontario, she began another small press (small, literally and figuratively) called presspresspress, the output of which she gave away as gifts to friends, never selling any of these productions. The collection at Sheffield contains a full set of these as well. The Adventures of Milt the Morph in Colour (the title was devised by Caruso herself) was the first collaboration between Caruso and Nichol.8 During the life of Seripress, the artist and the poet collaborated on ten titles. (Caruso believed that only two of these works—the two works discussed in this paper—were true collaborations, though Nichol disagreed, insisting that all the works he published with Seripress were collaborations between the two of them). 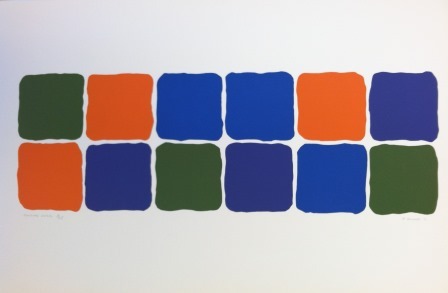 Milt the Morph is a series of silkscreen prints reminiscent of both the modernist design of Caruso’s Colour Lock paintings (massive four foot by twelve foot canvases) and the classic comic strip grid format. 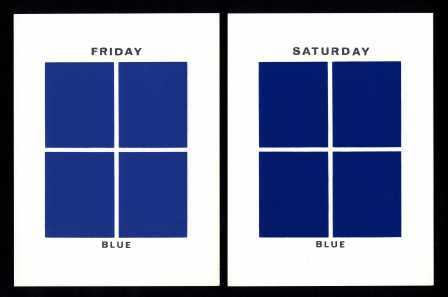 Each of the prints is composed of four colours; each colour is repeated three times in different positions and juxtapositions. The prints feature Milt the Morph, Nichol’s blank-eyed cartoon character who also appears in other works of Nichol’s. Caruso began printing Milt in mid-August 1971 in an edition of twenty-five, finishing in mid-September. The work was completed before Seripress was established, which is why the prints are dated 1971, the title page 1972, and its publication date 1973. The work sold well and was out of print by July 1974, inspiring Caruso and Nichol to continue with their collaboration. Caruso, we’ll remember, was initially horrified at the thought of Nichol drawing on her paintings as if creating a comic strip. In time, however, she contemplated how he could accomplish this, or at least give the illusion that that’s what he had done. She gave Nichol tracing paper to put over the frame page; Nichol drew his poem and his character on the tracing paper in black felt tip pen. Caruso then cut outside the lines of Nichol’s black lines and separated them from the frames; then she hand-cut the stencils and affixed them to the silkscreen. The frames that had been cut away allowed the colour-shapes to be printed around the lines. Nichol’s black-ink poem and drawings of Milt then appear white (the white of the page), participating in the colour. Milt the Morph , then, is in (or, inside of) colour. If the colour disappeared, the page would be blank. While Caruso’s works are ‘meticulously planar’ and about colour, Nichol’s drawings are most definitely the opposite in character. As seen in the image, left, leaf 2, from the serial poem Aleph Unit (1973), demonstrating Nichol's three-dimensional drawings. 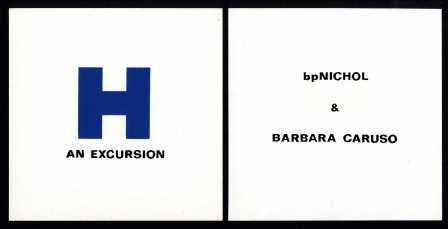 H: An Excursion , the second collaboration between Caruso and Nichol, was begun in 1973, but not published until 1976. Caruso wrote that the work was ‘bp’s idea’.12 This was not an easy collaboration. She writes: ‘Our “two perceptual systems”, our different temperaments and the uneven division of labour [he was apparently doing very little] became problematic.’13 Their collaborative problems reveal clearly the differences between their personal artistic modes of expression. 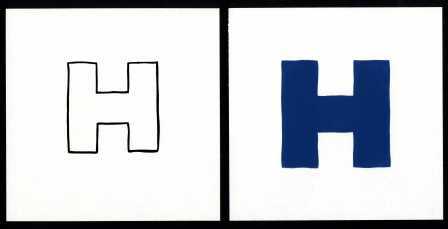 In 1975 Caruso embarked on a new idea for H . The letter starts out as a black-and-white planar ‘H’, then transitions into a coloured planar ‘H’. This second ‘H’ is then divided into three parts, then into five parts, then into seven parts; finally, the ‘H’ transforms into what resembles her Colour Lock Second Series . Caruso could only find meaning if each shape was a colour shape. 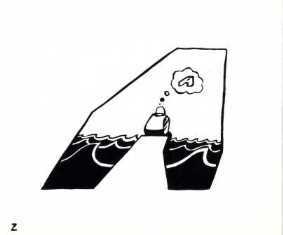 Because she had not used a three-dimensional block ‘H’, she did not show her idea to Nichol. She and Nichol ‘saw’ the H differently, which is where the difficulty lay. 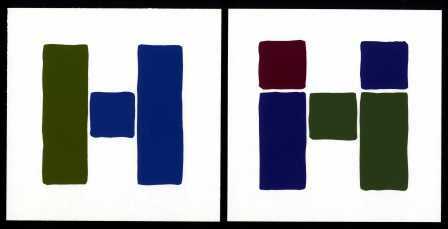 She states that ‘he seemed wholly engaged by that letter as a symbol or as one thing’.16 Caruso wanted the ‘H’ to be more than ‘one thing’; she wanted the ‘H’ to be fragmented into a series of colour parts in order to explore, as she put it, ‘relationships and interrelationships of the colours.’17 Caruso wanted to abandon the collaboration, but Nichol persuaded her to continue. Finally, in 1976, Caruso presented Nichol with her idea. He liked it. But after the printing was completed Caruso felt uneasy about the work. It dawned on her that the 10″ x 10″ page with its excess margin was wrong; she cropped each sheet to 6″ x 6″ and was pleased with the result. The Adventures of Milt the Morph in Colour and H: An Excursion were the only two Seripress titles that Caruso believed to be ‘intended’ collaborations. bp, however, thought all the Seripress titles were collaborations. From My Window is all about the colour blue. The hue changes throughout the sequence; this subtle progression fascinated Caruso. 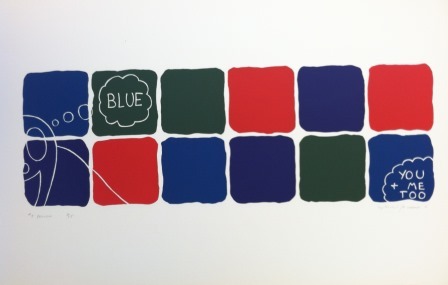 The word ‘blue’ and a colour ‘blue’ appear on every page. She considered From My Window their finest work together, though she did not recognise it as a ‘formal collaboration’ because it was an idea that evolved quickly in one afternoon. Blue was Nichol’s favourite colour. For him it was a word, a sound, a name, an idea, and only lastly a colour. 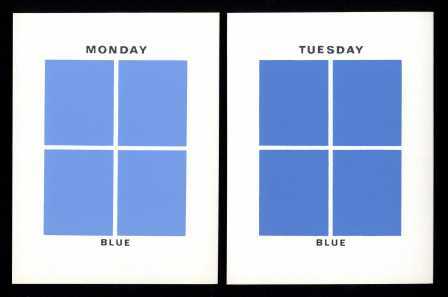 Caruso sought to visualise how the poet saw, thought, wrote, and spoke the phenomenon of ‘blue’. 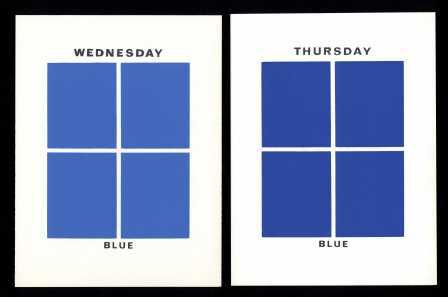 To do this, Caruso didn’t create one blue and simply darken the shade. Instead, she mixed seven different blues individually to make a new ‘meaning’ on each page. Her input was conceptual, while the design work came specifically from Nichol’s drawings, which is why she added her name to the colophon but not to the title page. Caruso’s work with Nichol for Seripress is not straightforward; one does not simply ‘read’ these books. 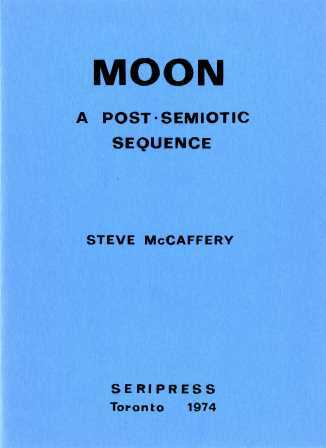 Seripress isn’t a typical non-mainstream or avant-garde poetry small press because such presses usually printed inexpensive chap-books or pamphlets quickly. Nor is Seripress a typical fine press. Seripress published solely avant-garde poetry, and fine presses typically didn’t publish avant-garde poetry. Art critics have not discussed Seripress because Caruso’s work at Serispress is not considered ‘serious art’. Meanwhile, poetry critics have avoided discussing Seripress titles because of the integral interconnection of the poetry with the artwork. So few people in the art and publishing worlds talked about Seripress. Where did Seripress fit in? Where does it fit in now? As a press run by a visual artist working with, and publishing, avant-garde poets, Seripress occupies a unique space between small poetry presses and fine presses. Seripress was a fine, small private press which published advanced poetry often as pictorial artworks. Seripress is positioned uncompromisingly between the two worlds of art and poetry . 1 From a review of Caruso’s poem ‘Silence’ (one of her presspresspress titles, which she dedicated to bpNichol) by jwcurry in 1Cent Series, no. 271 (Toronto: CURVD H&z, 16 February 1991), a newsletter self-published by jwcurry in an edition of 200 copies. 2 Diary entry dated 17 December 1973, in Barbara Caruso, A Painter’s Journey, vol. 1, 1966–1973 (Toronto: The Mercury Press, 2005), 252. 3 Diary entry dated 12 April 1971, in ibid., 105. 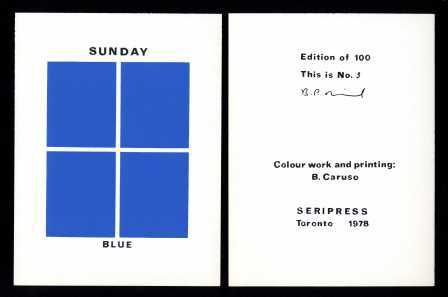 4 Barbara Caruso, ‘The Seripress Collaborations: Nichol & Caruso’, in St. Art: The Visual Poetry of bpNichol, curated by Gil McElroy (Charlottetown, PEI: Confederation Centre Art Gallery & Museum, 2000), 52. 5 Barbara Caruso, ‘Letter to a Poet. 5 May, 1990’, in Wording the Silent Art: Essays and Writings (Toronto: The Mercury Press, 2001), 189–93. 6 Diary entry dated 17 December 1973, in Caruso, A Painter’s Journey, 1:252. 7 Caruso: ‘The Seripress Collaborations’, 53. 8 For Cameron Anstee’s excellent discussion of Milt, see his ‘“These words are another drawing”: Barbara Caruso, Seripress, and Concrete Poetry in Canada’. Paper presented at conference The Page: Visual and Material Literature, University of Ottawa, 14–16 March 2014. 9 Diary entry dated 17 December 1971, in Caruso, 1:132. 10 Diary entry dated 15 August 1975, in Barbara Caruso, A Painter’s Journey, vol. 2, 1974–1979 (Toronto: The Mercury Press, 2008), 63. 11 Caruso, ‘The Seripress Collaborations’, 59. 19 Diary entry dated 15 April 1975, in Caruso, A Painter’s Journey, 2:41.